I guess I can post this now. 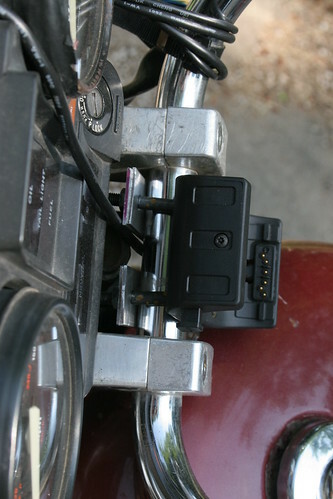 A while back I built a custom receiver to attach the Garmin Montana Rugged Mount to my Honda Magna. This product is a harness for the Montana GPS that fits the RAM bracket mounting system. However, most of their mounts involve some sort of arm mechanism, and I had a much better location on my bike. The Montana mounts just below the instrument cluster, almost like it belongs there. 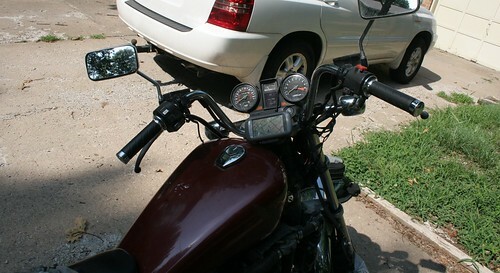 I used four strips of aluminum, two on each side, to hold the mount to the handlebars. I need to find some stainless steel bolts, as the hardware store didn't have the right ones and they're showing a little rust. The swap will be a good winter project.